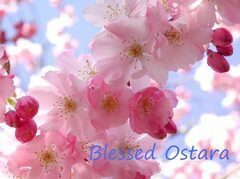 This Sabbat, also known as “Oestara”, “Eostre’s Day”, “Rite of Eostre”, “Alban Eilir”, “Festival of the Trees” and “Lady Day”, takes its name from the Goddess Eostre (or Oestre), who is a Teutonic Goddess of dawn, and the spring, and whose name means “moving with the waxing sun.” She is commonly pictured standing surrounded by spring flowers, holding an egg in her hand. There are birds flying above Her and there are always hares playing in the grass at Her feet. Celebrated on the Vernal Equinox, as the Sun moves from Pisces into Aries (usually on the 20th or 21st day of March), Ostara represents the first day of Spring. This is the time of balance between the hours of daylight and darkness as Mother Earth awakens from her dormant period of rest. The trees begin to show buds of new growth, daffodils and crocuses are in bloom, and the swallows return to share their sky-dance of joy with us. Along with Mother Earth, we stretch and open wide as we turn our faces towards the Sun. This is the time of fertility and new growth – a time to celebrate the joy of new beginnings. As the light grows and the days grow longer, we choose the seeds that we will plant in our gardens, and in our lives, and dream of what we are creating. (If you are fortunate enough to live on Vancouver Island, as we do, then you can actually get out and plant some of those seeds!) In this Magickal time of fertility, nothing seems to be beyond our ability to create. In our story of The God and The Goddess, we may see Them to be represented by a pair of sweet young human adolescents. The Goddess, who had left behind Her phase as The Crone and became a Maiden again at Candlemas, is now maturing and growing fertile. The young God, who was born at Yule, has grown stronger with the waxing sun. Now, at Ostara, He, too, hears the call of fertility and regeneration with every beat of His heart. The young couple becomes more and more aware of an attraction to each other and The God courts The Goddess, whose heartbeat dances to the same call. As this courtship progresses, the Earth stirs and is renewed once again. In my heart, I like to see Them meeting in an orchard. The sun is shining and the earth smells sweet and green. The trees are just budding and there are daffodils and crocuses exuberantly blooming under them. The swallows are dancing in the blue sky and there are robins building nests in the trees. Of COURSE there are bunnies doing their spring fertility bunny-thing, chasing each other around the trees. Just how far that courtship gets at Ostara is a matter of opinion. In some stories, we see Them sweetly and tentatively finding their way towards each other now, and that journey is completed at Beltane. In other stories, we see Them finding their ways towards a physical union at Ostara, and then we see Them wed at Beltane. This seeming discrepancy is just fine with me. The stories by which we come to understand The God and The Goddess are as much the same, and as different, as we are from each other. The stories are our very subjective ways to explain what we see and how we feel. Because we can only share what we know, they also represent who we are, and where we live, when we tell them. So, from what I can understand, if the person who is telling the story lives in a place where it is still cold at Ostara, and where the ground is still not quite ready to plant the seeds of renewal , then that person might very well see the act of completion as occurring at Beltane. From MY backyard, here on Vancouver Island, I will have flowers blooming and there will be seeds in the ground on Ostara – so my heart sees the young couple sweetly connecting at Ostara and then formalizing that connection six weeks later, by dancing the Maypole at Beltane. Either way, it is all about fertility and renewal. As is exuberantly echoed throughout nature all around Them, the young God and Goddess will come together. From that union, from that spark of fertility, all of life is created. Later, at Yule, we will all rejoice as we see The Goddess give birth to The Sun God, who was created by that act of renewal. We see the theme of regeneration in the other stories that we particularly remember at this time; such as those about Ishtar and Tammuz, Persephone and Demeter, Inanna and Dumuzi. The stories about sacrifice and renewal come from every culture and from many faiths. In some cases, they may be culturally specific, but the themes are echoed all over the world. Personally, coming from a strongly traditional Christian background, and after many years of searching for a Path that would best suit me, I find it very interesting to compare these stories. I distinctly remember, as a twelve year old sitting in Confirmation classes, being rather bewildered about just how the Anglican Church figured out when Easter Sunday would be every year. Just how did “the first Sunday following the first Full Moon after the Vernal Equinox” come to be the way that the date of such a sacred event was calculated? If Christmas Day was a set date, because it represented a specific event, then why was Easter different? Ahhhh….now I SEE! But that is another story….